﻿When planning a long evening of fine wining and dining, smaller portions can sometimes be better and I am not talking about the food! Clever wine farms now understand the need for lovers of the good stuff to offer more of their products in smaller bottles! This makes sense and allows for the adventurous diner to try different styles of wine with each course rather than be lumbered with one standard size bottle! The half size bottle is also perfect when your partner would like to drink something different to what you choose and so preventing any ensuing arguments! After all wine is subjective and we must enjoy what we want and not have to succumb to what your friends are drinking! However there is usually never an argument about starting the evening with a glass of bubbly before moving onto wines for the dinner and what better way than sharing a small bottle of local Cap Classique. 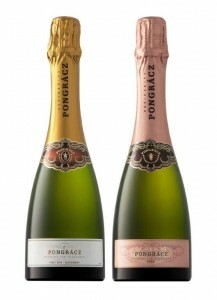 Launched last week the popular Pongracz bubbly, both the Brut and Brut Rose, is offered in a stylish 375ml bottle making it ideal as a pre-dinner bubbly or a relaxing after work indulgence when a glass or two is all you need! The Brut is a delicious blend of the classic Champagne varietals, Pinot noir and Chardonnay. Aromas of crisp green apple entice you towards the refreshing palate which starts off with a fine mousse leading to yeasty citrus flavours and dry finish. The Rosé has a sunset salmon hue with warm raspberry tart aromas. The flavour begins with a rich foamy mouthful of black berry fruit and delicate yeasty notes with an elegant full finish. The bottles are easy to cellar and don’t take a lot of space in your fridge either…I should know as I have bought a case of each!